Terrorism-related charges are pending against a man accused of stabbing a police officer and deliberately plowing a cube van into pedestrians in Edmonton on Saturday night, the RCMP says. The suspect was known to both RCMP and police, RCMP K Division Assistant Commissioner Marlin Degrand told a news conference at Edmonton RCMP headquarters on Sunday afternoon. The man is a Somali refugee. 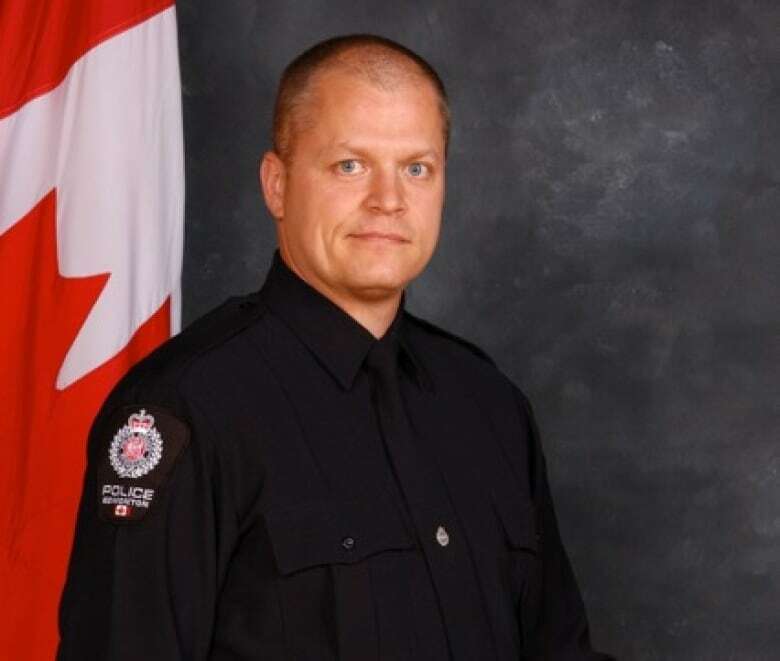 In 2015, after a complaint was made to the Edmonton Police Service that the man was displaying signs of extremism, members of the Integrated National Security Enforcement Team (INSET) launched an investigation, Degrand said. The suspect was interviewed by members of INSET, but there was "insufficient evidence" to make an arrest and the suspect was deemed "not a threat," Degrand said. Abdulahi Hasan Sharif is the man accused in the attacks, multiple sources have told CBC News. Degrand said the suspect has yet to be charged but is under arrest for offences including participation in a terrorist attack, commission of an offence for a terrorist group, five counts of attempted murder, dangerous driving, criminal flight causing bodily harm, and possession of a weapon for a dangerous purpose. The 30-year-old suspect in the attacks was apprehended following a high-speed chase just before midnight through streets filled with bar patrons and Edmonton Eskimos football fans. Police have said they believe the man acted alone. 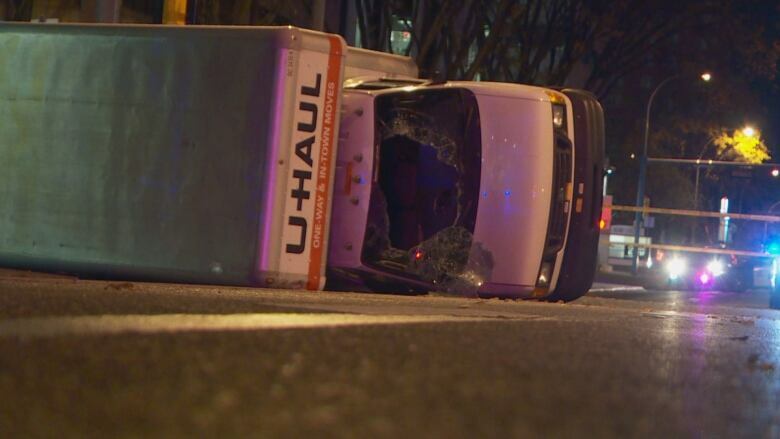 The chase came to an end after the white U-Haul van he was driving struck four pedestrians and flipped on its side. The injured police officer was taken to hospital and treated for non life-threatening injuries. Four pedestrians were injured, with injuries that ranged from "broken arms to brain bleeds," police Chief Rod Knecht said during Sunday's police news conference. One person who was listed in critical condition has been upgraded to stable. Two others have been released from hospital. The fourth victim suffered a fractured skull but has regained consciousness, said Knecht. Const. Mike Chernyk, 48, was the officer injured in the violent altercation. He has been with EPS for 11 years and was conducting traffic duties outside the Edmonton Eskimos game Saturday night. He has since been released from hospital and is expected to make a full recovery. Chernyk suffered stab wounds to his face and hands during the knife attack, said Knecht. He said the details of Saturday's attack on the officer are "sobering." "He was in a struggle for his life," Knecht said, "holding onto his gun with one hand and fending off the knife with the other." EPS Sgt. Mike Elliott, vice-president of the Alberta Federation of Police Associations, said even though Chernyk is a "switched-on guy," he was still surprised at his ability to fight off the suspect. "I wasn't sure he'd even be in condition to fend anyone off after being hit like he was," Elliott said. "Just to see him battle like he did, it's amazing, and I'm proud of him to see how he fended off that suspect." Public Safety Minister Ralph Goodale said in a separate news conference on Sunday in Regina that INSET was working closely with the Edmonton Police Service on the investigation. The officer was working alone at the time of the attack, said EPS Sgt. Michael Elliott, vice-president of the Alberta Federation of Police Associations and director of the Edmonton Police Association. Normally officers work exclusively with partners, but exceptions are made when members are hired as security or traffic control officers for special events. "A lot of questions have come up," said Elliott. "People ask, why was this member alone? "In this unfortunate incident, he was working a special duty event so he was actually hired to work the football game. But on the street, we have criteria that when you're working, specifically at night, you're always partnered up. You always have someone." Elliott said the incident has left Edmonton's law enforcement community rattled, and he's encouraging officers who may be struggling to seek help. "We just want to make sure that our members are well taken care of, not just physically but mentally as well," he said. "As you can imagine, it's a trying time for every member because questions get raised like, 'Why did this happen?' "
Goodale said the national terrorism threat level for Canada remains at "medium" and by all indications, public safety has been restored. Canada will not be intimidated by terrorist violence, he said. "We will not be intimidated by a brutal act of hate," said Goodale. "Together, we condemn terrorist violence, today and every day, and we will never allow it to contort the way that we want to live our lives." The series of violent events was likely the work of a "lone wolf," said the city's mayor, Don Iveson, who called for vigilance and community solidarity after the chaotic night. 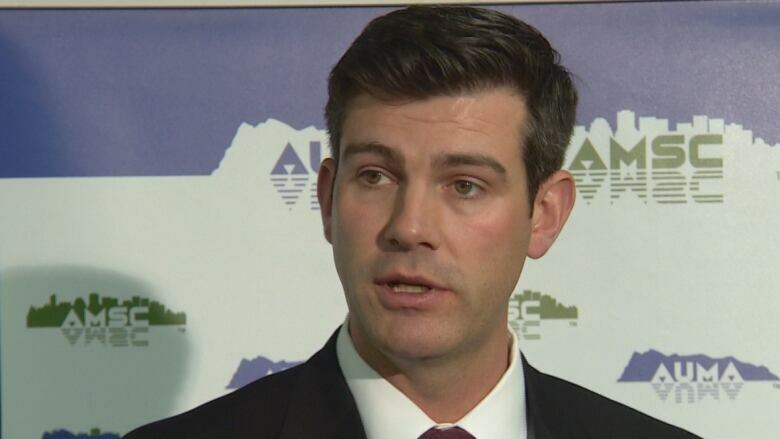 "I wish to urge calm," Iveson told a news conference Sunday. "To the best of our knowledge this was a lone wolf attack. Edmonton Mayor Don Iveson urged calm at a news conference Sunday, confirming the suspected terror attack in Edmonton Saturday night was likely a 'lone wolf' incident. "Terrorism is about creating panic and sowing divide and disrupting people's lives, so we can succumb to that or we can rise above it." Iveson described Saturday's events as "appalling" and commended first responders for their bravery in the "face of chaos." He urged Edmontonians to remain calm and united as the investigation continues. But Iveson stressed he's confident that police are "fully in command" of the situation. "It is vital now that we not succumb to hatred, that we not be intimidated by violence, and that we respond with love and strength," Iveson said. "We will not be divided." In a written statement, Alberta Premier Rachel Notley described Saturday's events as "horrific." "It's left us shocked at the indiscriminate cruelty and angry that someone might target their hatred at places where we gather with our families and friends," Notley said in the emailed statement. "Hatred has no place in Alberta. It's not who we are. We are in this together and together we are stronger than any form of hate." Notley said her thoughts remain with the victims, their families and the first responders who showed "incredible bravery." "Our first responders are incredible people. Thank you to each and every one of our police officers, paramedics and firefighters who put their lives on the line to keep us safe," she said. "Thank you, also, to the women and men who dropped everything to help their fellow Albertans. Your bravery in moments of fear and your compassion in moments of chaos are what's very best about us." Members of Edmonton's Muslim community strongly condemned the attacks and called for solidarity within the community. Edmonton human rights activist Ahmed Abdikadir said he felt "anger and frustration" at news the violence may have been the work of a terrorist. "I'm frustrated that something like this could happen here in Edmonton, right here in my backyard," said Abdikadir, chairperson of the steering committee of the Safety Summit, a grassroots organization that addresses crime and racism. "I want to compliment the heroic actions of EPS. If they were not there, the law enforcement, it would have been a completely different tragic outcome. "To the Edmonton community at large, I would like to tell them that we stand together and unite against hate. And let's solve this problem collectively, rather than pointing fingers at each other." Prime Minister Justin Trudeau issued a statement Sunday, saying he was deeply concerned by Saturday's events. "The Government of Canada and Canadians stand with the people of Edmonton after the terrorist attack on Saturday," he said. "I am deeply concerned and outraged by this tragedy." "We cannot — and will not — let violent extremism take root in our communities. We know that Canada's strength comes from our diversity, and we will not be cowed by those who seek to divide us or promote fear," Trudeau said. In a statement from the White House, the Office of the Press Secretary condemned the "cowardly" attacks on a police officer and pedestrians. "Law enforcement authorities from the United States are in touch with their Canadian counterparts to offer assistance with the ongoing investigation," the statement said. "Our thoughts and prayers are with the victims, as we hope for their speedy and complete recovery." Edmonton police released grainy footage of a car ramming a crowd control barricade with a uniformed officer standing beside it. The footage shows the officer being tossed about five metres into the air as the car slams into the front of a parked police cruiser. The video shows two people walking by with their dogs rushing towards the officer on the ground. But they run off when the driver gets out of the car and appears to start stabbing the officer. The police officer appears to wrestle with the driver on the ground and, at one point, it appears the officer is on top of the driver. Footage shows them both getting to their feet and the driver runs across the street while the officer slowly follows him into traffic. Police launched a manhunt for the suspect. Knecht said an Islamic State flag was found in the front seat of the car and was seized as evidence. A few hours later, while fans filed out of the football game and were re-routed around the crime scene, a U-Haul cube van was stopped at a checkstop north of downtown. Knecht said the name on the identification was close to that of the registered owner of the white Malibu. Knecht said that when confronted, the U-Haul driver sped off toward downtown with police cars in pursuit. The van intentionally swerved at pedestrians in crosswalks, Knecht said. The name of the suspect was not released. Knecht said he was known to police, but there was no warning for the attack. Witness Matthew Ireland, who had been at the football game and had heard that a police officer had been stabbed near Commonwealth Stadium, was waiting in line to get in to The Pint, just north of Jasper Avenue on 109th Street. "We thought maybe it was just oh, a guy running from the cops, just a police chase as usual," Ireland said. "And the next thing you know we start to see him swerve in towards the back alley there. "I could just see the look of panic on the guy's face. Like he knew he was in trouble, he knew he was done, he was going to get caught pretty soon. So he just started swerving and trying to hit people," he said. "And he hit two individuals that were just standing in the back alley there. And I could see a pair of glasses or a cellphone go flying down the alley." Police cars followed the van and a couple of officers stopped to seal off the area, Ireland said. Bouncers from the bar and bystanders rushed to help the two people who had been hit by the van. "For those individuals, I'm kind of heartbroken, to say the least," he said. "They're just out having a fun time, and wrong place, wrong time, I guess you could say."